Milk Factory is having its final clearance sale online! 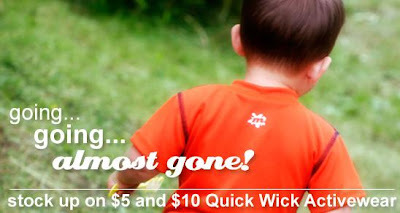 Grab these deals on quick wick activewear for infants and toddlers! If you live in the Vancouver area, save shipping costs by picking up your order, just choose "free local pick up" and save on shipping. Shipping is based on purchase and location. Shop in person at their studio on Friday, April 20 and Friday, April 27 from 10 am - 5 pm. There will be a "FREE" bin for shoppers to select one item from, with any purchase over $50. Shop this deal at www.milkfactory.com/sale. Their studio is located at 795 East Cordova Street, Vancouver, BC. 0 Response to "$5 and $10 Quick Wick Activewear Tops, Bottoms from Milk Factory"